How did you carve to top on that? oop, never saw which section, but it does say something that people are making thier own guitars in the style of the RGA or xxxx model because the style is present straight from the manufacturer and the guitar is desrable but the specifications are not. 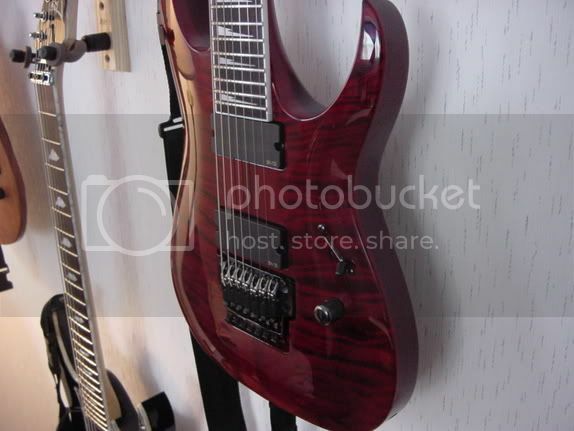 anyway, I have an RGA with spalted beech top coming soon , I dont think Ibanez will make one of those. Missed this post originally, but in my opinion customs almost never work out the way you hope they will and cost a fortune in both cash and wait times. Put something in my hand and tell me the price, and I'll be interested. Sell me an expensive wish a year or two down the line...no thanks. Been there, done that, no interest in going back. Carvin is as custom as I'll ever be interested in going. I guess I'm an exception then... my KxK cost about the same as a new UV, took 11 months, and is by far the sweetest guitar I've ever played. To be honest though I ordered it on a special introductory pricing offer, so it would be more expensive now. I would buy that Broderick guitar in a heartbeat! In case someone hasn't seen this already... RGA7 in action. archtop, neckthru RG 7 string with a floating bridge?!!? HOLY MOTHER OF GOD. Garuanteed sale right here if Ibanez makes it. No question - like the dude on 7stringorg said - 'money in our wallets and lust in our hearts'. There's money to be made here!! I would buy RGA7 in any color, bolton or neckthru. Even living in the 3rd world.